← Turkey Taco Rice Bowl with Pico de Gallo & Avocado Slices. Quarter the grape tomatoes and transfer to a medium salad bowl (that will hold the pico de gallo salsa). Juice the lime and add to the salad bowl. Trim off and discard the ends of the onion and remove the outer layer; small dice the onion into ¼-inch pieces. Transfer one ½ of the diced onion to the salad bowl and the other ½ to a small bowl. Add coconut oil to a nonstick skillet and preheat over medium heat. In a small bowl, combine and mix together chili powder, cumin, oregano, garlic powder, onion powder, salt, and pepper. Once the skillet is hot, add the remaining onion; cook, stirring frequently, until softened, 3 to 4 minutes. Add the ground turkey to the skillet; cook, breaking apart with a spoon, until browned and crumbly, 3 to 4 minutes. Add the spice mixture to the onion and turkey; stir until fragrant and well combined into the mixture, 15 to 30 seconds. Season the pico de gallo with salt and pepper; toss to combine. Remove the pit from the avocado with a knife or spoon; thinly slice the flesh crosswise (without piercing the skin) and scoop out. Transfer to a small bowl. 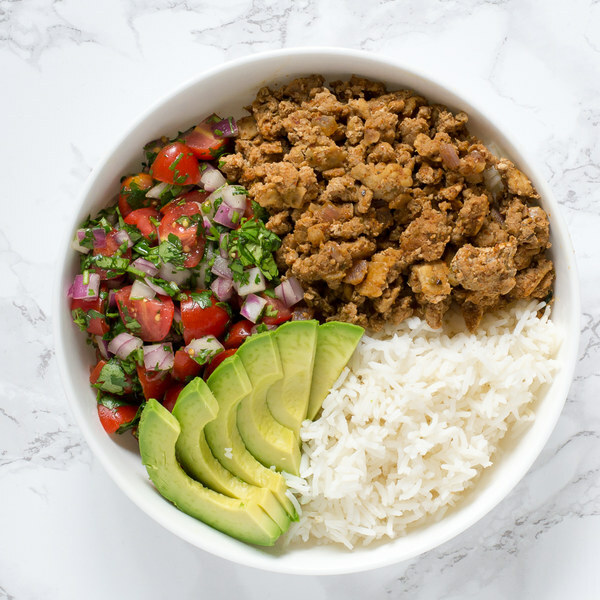 To serve, arrange the rice, ground turkey, pico de gallo, and avocado slices in bowls. Enjoy!